Places we love to work. This glorious place is located north of Revelstoke, BC, nestled up against the Eastern Rockies. There is no road to the lodge and it is strictly fly-in and out. Some of the steepest deepest lines I’ve ever had. Pillow stacks the size of a “Giants” pancake breakfast that will have you bouncing down snow till the end of the day. This wild interior British Columbia operation is a renegade in my eyes, but in a good way. They ride it all here. Amazing glades and a really down to earth staff. After choking on powder all day we were treated to a fire pit and beers at days end when our steamy and stoked snowcat came back down to the lodge. This place is one of the originals and I’m calling it Gangster cat-skiing. Its lodges, terrain and food are all time exceptional. Go here and ride lines you’ve seen in movies and magazines, while living the snow gangster lifestyle. Ahhhh.. the Lake! I’ve ridden here more than any other place in the world. It’s my home mountain and always will be. The steeps of Whitehorn and the perfect grooming make this place a go-to in all conditions. It’s always good! Best views in Canada. Just outside of Revelstoke, this boutique heli operation has everything you need and they make sure you get the goods. We love this place. Filmed some amazing shots here. Must get back ASAP! Canada’s oldest backcountry lodge is tucked in behind the Lake Louise ski area. Take the time to ski out there and take in the history. The perfect winter cowboy location. The license plate reads “Greatest Snow on Earth” It just might be. Awesome lift access and long runs with a snowpack bigger than most in North America. Brighton ski area has a ton of options with an amazing terrain park. Just over in the next canyon is Snowbird ski area. The access from the top of the Tram is world class and there’s tons of snow for everyone. VALLE NEVADO, Chile, South America. Fly straight down to Santiago, Chile from any where in North America in the summer and jump right into winter snowboarding and skiing. 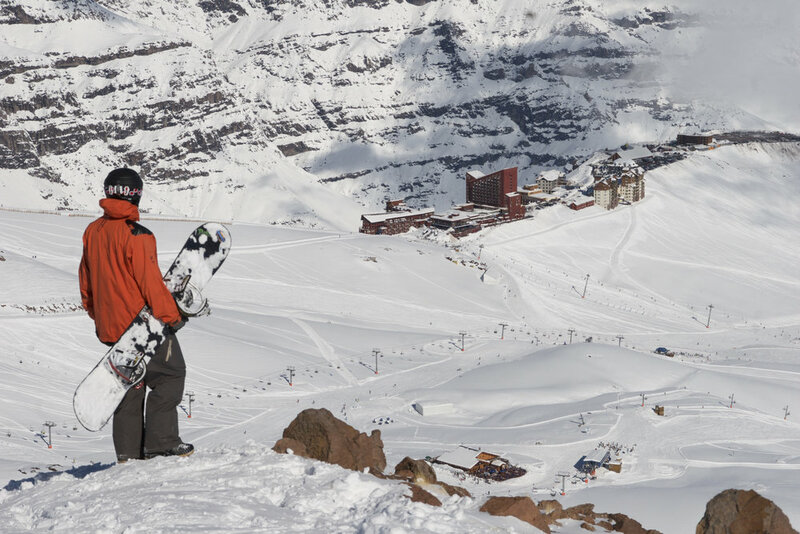 Valle Nevado ski resort is just under 2 hours from the airport. You can stay up at the resort or do day trips and explore the vibrant streets of Santiago by night. Deep snow and deep snow. That’s what this South American resort is all about. It will take you back to a time when the powder just doesn’t get tracked out in one day. I love this place. I got to snowboard here on a beautiful spring day and had some amazing turns. They fly out of the Panorama, BC ski area base. It’s easy to get to from Banff, Alberta and the Calgary airport in just a day.